Richard Matthew Stallman is an American software freedom activist, hacker, and software developer. In September 1983, he launched the GNU Project to create a free Unix-like operating system, and has been the project’s lead architect and organizer. 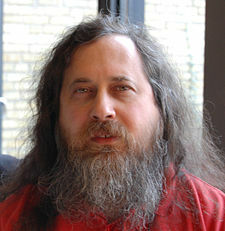 With the launch of the GNU Project, he started the free software movement and, in October 1985, set up the Free Software Foundation. Direct democracy is one of the things we need to establish, to take back control of the US government from the megacorporations that effectively own it now.